Activists at a San Diego public safety hearing tried to force a conversation about the former police chief’s testimony to the City Council, but officials changed the subject. A month after it was revealed that the San Diego Police Department presented misleading statistics about crime tied to marijuana businesses to the City Council, members of the Council’s public safety committee didn’t ask a single question on the issue. Lt. Matt Novak presented the public safety committee with an update on the department’s efforts to eliminate illegal delivery services Wednesday. He said the crackdown had netted 34 arrests, 230 pounds of marijuana and $60,000 in cash since August 2017. The committee members did not question Novak about those numbers, or about data cited by the department in September 2017 that have since been shown to be deceptive. In the 2017 presentation, then-Police Chief Shelley Zimmerman strongly urged the City Council against allowing permits for businesses that cultivate, manufacture and distribute marijuana. She warned that those enterprises would create more crime. A closer look at those calls for service, VOSD reported in June, revealed that many did not stem from the dispensaries, but from other businesses and locations nearby, and many of the alleged crimes were mundane, including dozens of false security alarms and crank calls to 911. Yet Zimmerman’s testimony is being presented to other cities to derail new marijuana outlets. Public records obtained by VOSD suggest that Novak helped Zimmerman on her research and talking points. In an email to Oceanside’s police chief in April, Novak mentioned a presentation he gave Zimmerman about a trip to Denver, which included interviews with other law enforcement sources there. 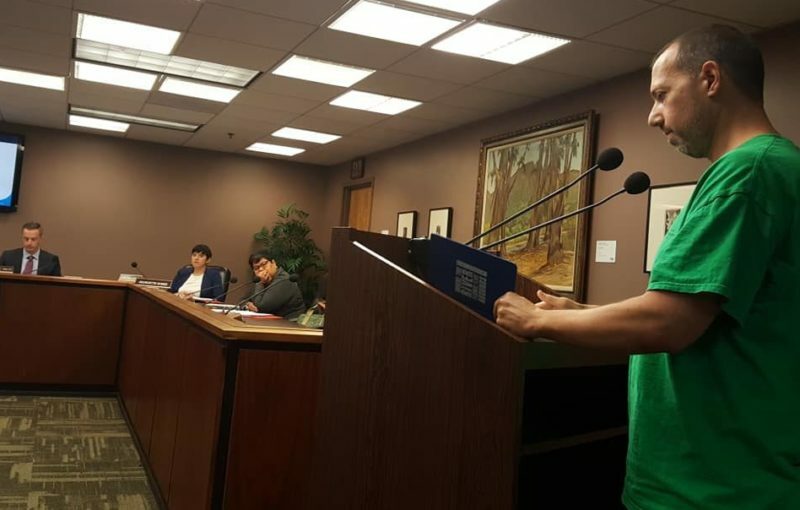 The only member of the committee to ask any question of Novak was City Councilwoman Georgette Gomez, who wondered about the total number of illegal marijuana delivery services still operating in San Diego and whether more money would help police. “Of course, we can always use more resources,” Novak responded, but noted that the marijuana enforcement unit was fully staffed. City Councilwoman Barbara Bry, vice chair of the committee, called the San Diego Police Department “a national model for this type of enforcement” and quickly moved on to another item on the agenda. Though committee members didn’t mention the statistics Zimmerman presented, members of the public who attended the meeting certainly had them in mind. “It is shameful that we’ve made national news for having a police chief mislead City Council to further the police department’s long-held bias against cannabis,” said Mara Felsen, an attorney, referring to national attention resulting from the VOSD report. Another speaker at the meeting, however, praised the Police Department’s enforcement efforts. Rath applauded the city for “knocking down” illegal storefronts and illegal delivery services – 11 in the last year, according to Novak’s latest presentation – but noted that there are still plenty listed on sites like Weedmaps. “I don’t think that’s the fault of any of the people who are in this room today,” he said. Correction: An earlier version of this post misidentified Bry as chair of the public safety committee. She is vice chair.